On my way to Bosnia and Herzegovina, we made a quick stop in the famous Serbian Ethno village Drvengrad (wooden village), situated in the Zlatibor District. We were greeted by wooden houses, green backyards, tiny streets and blossoming trees. Although the village is small itself, I was eager to see every single house and to take a photo of it because they were all unique. I have never been to such a village before so I was very impressed. It was more than obvious that Emir Kusturica gave the best of him to build this village. The famous Serbian filmmaker decided to build it after he lost his home city (Sarajevo) in the war. The other name of Drvengrad is Kustendorf (Kustu – Kusturica and dorf (DE) – village). The third name of the village is Saringrad (colourful town). Drvengrad is the home of a movie festival that is being held here every year. The idea is to present not only Serbian but movies from all around the world. Some of the most famous actors have visited the village. Johnny Depp was one of them. Entering Drvengrad I found myself on the main square. There was a church at the end of it – named after the Serbian Archbishop St. Sava. Every single house here was built in honour of a famous person – Nikola Tesla, Ernesto Che Guevara, Diego Maradona, Novak Djokovic, Serbian and worldwide actors, directors, writers and musicians. There were also wooden stalls where they were selling souvenirs and local production. Drvengrad has also a swimming pool, a cinema, a gymnasium, a sport hall, a restaurant, a sweetery, etc. The weather that day was lovely and we enjoyed walking around under the heating sun. Besides that, I am sure that this place is magical during winter. Accommodation is also available and it must be an exceptional experience. Unfortunately, I visited Drvengrad for less than an hour so I’d be happy to come back again. 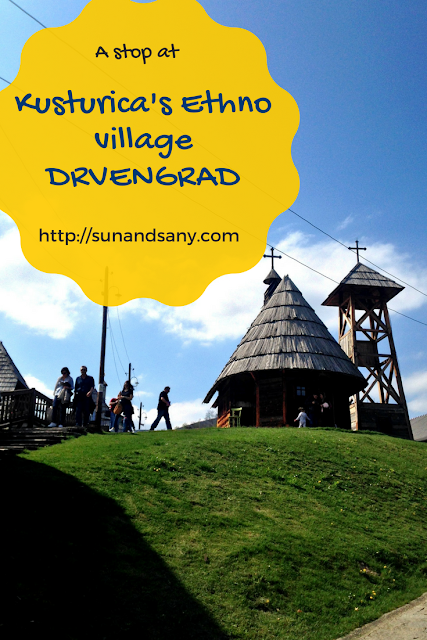 An interesting village is Drvengrad. Peacock identity and tranquility. I will definitely visit this village if I'm ever in the area. Everything looks so idyllic and neat. You should! I am sure you'd enjoy it a lot. Beautiful post with great photos! The landscape , the old houses , everything is so beautiful ! Thanks, Ivonne. Yes, I am glad I went there even though it was for just an hour. The idea behind it is very nice indeed, I wish we had something similar in Bulgaria. 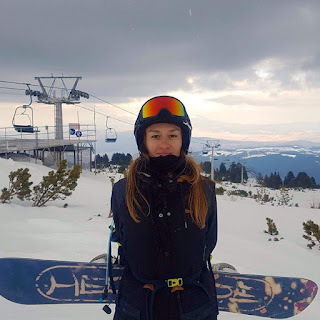 I was happy to visit your country and especially Drvengrad, Tijana. Yes, I saw almost everything there but a night spent in one of the guest houses would be a nice experience. How cool you have done it! Drvengrad may be a small village but it certainly is not lacking in charm. It's really cool how each house is unique in it's details. It looks so lovely this time of year but I'm sure it would be pretty amazing covered in snow during the winter as well. Hope you're enjoying a fantastic week Sany! I agree with you Rowena. I have seen photos of it covered with snow, and it looks charming. Wow. I can't even begin to imagine what this would be like in the winter with all that snow. What a gorgeous little village. I definitely need to see this in my lifetime. Thanks for sharing this S! This is one of the prettiest, most interesting places I've ever seen online. Thanks for bringing us there!